Hurricane Harvey in August 2017 went down on record as being the wettest tropical cyclone and costliest natural disaster in the history of the United States. A huge portion of this devastation took place in Houston Texas, where thousands of families were instantly displaced from their homes due to extreme flooding, losing everything they owned. One such family was the Bowden family. Timothy and Jazmin and their two young daughters Vanessa and Liliana had no idea what was coming their way as they prepared to weather the incoming storm. When meeting them to hear their story, I was amazed at their resiliency and depth of gratitude for the way the Central Coast community has supported them through this harrowing experience and the devastating aftermath. As they shared about their experience during of Hurricane Harvey, Timothy recounted his daring swim to reach his family during the worst wave of the hurricane. On the second day of the storm, Timothy faithfully went to work as usual at the restaurant he managed. That day as the storm raged, high winds tore the roof off of the building and all employees quickly evacuated. In an effort to get across the city to his family, Timothy crossed police lines until he could drive no further into the flood; he ended up abandoning his truck and swimming for miles over the tops of cars and buildings to get to his wife and daughters. After making it through, together they were able to ride out the rest of the storm in the upper levels of their apartment building together with their neighbors. Once the storm passed, it was clear that the building would have to be evacuated and cleared of all of their ruined possessions. The Bowdens, along with their neighbors, were forced to leave, and were placed in hotels with nothing but an occasional food bank delivery to survive on. Rather than waiting for countless months in a hotel to get the support they needed to get back on their feet, Timothy and Jazmin decided to bring their girls to Atascadero where Timothy’s mother Cynthia lives, with nothing left of their possessions except two small bags of clothing. Cynthia booked train tickets for the Bowden family to travel from Texas to California, but the lines were shut down due to severe flooding. Timothy had to spend his savings on four plane tickets to get to Cynthia, but the family arrived safely. They booked into a hotel in Atascadero and began searching for a home, but soon realized that finding housing on the Central Coast would be challenging. Knowing they needed help, Timothy and Jazmin’s first stop was with the Department of Social Services to get food stamps and find out what other support were available. DSS referred them to the Housing Support Program (HSP) for support in getting back on their feet and secure housing. Before starting HSP, the Bowdens did everything they knew to apply for housing, not realizing that there were much more efficient strategies. As soon as they started meeting with their HSP Case Manager, they were given very effective tools and support searching for and applying for housing. They went to classes and learned how to set a budget according to their current income, and put together portfolios of necessary information and continued their housing search better-equipped. 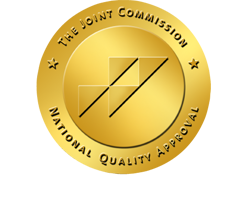 They even received support taking care of lingering utility bills from Texas so that their credit would improve. 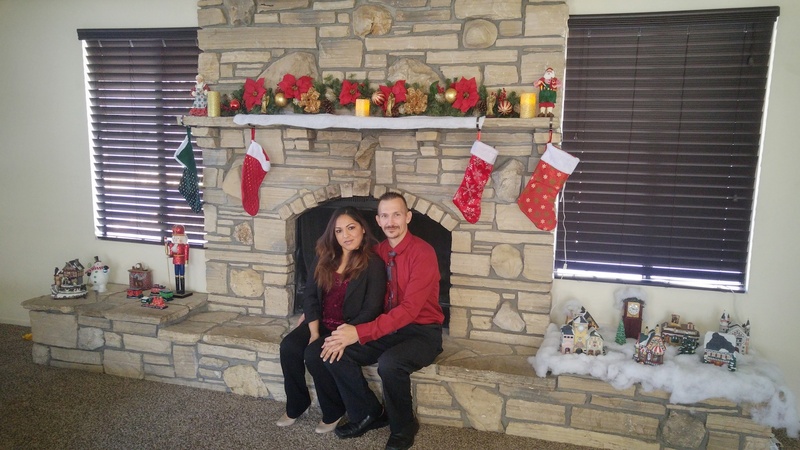 Soon after arriving in Atascadero, both Timothy and Jazmin were offered jobs, especially when local managers learned of their situation. After only a few weeks of applying for housing with HSP support, they were offered a beautiful and affordable home for their family. While Hurricane Harvey brought so much loss and sadness, the Bowdens are trying to see it as a new beginning with hope and help. Thanks to the loving embrace of our community, they have not experienced desperate need or hunger, and are looking forward to a future and home in which they will thrive. They have had every need met with unbounded generosity, and they express their gratitude for it every opportunity they have. You, our community, have welcomed this beautiful family in, and have treated them as we all would all like to be treated, with graciousness and open hearts. This is the spirit we celebrate together during this joyous season. Below are pictures of Hurricane Harvey's destruction in Houston, as captured by Timothy Bowden. 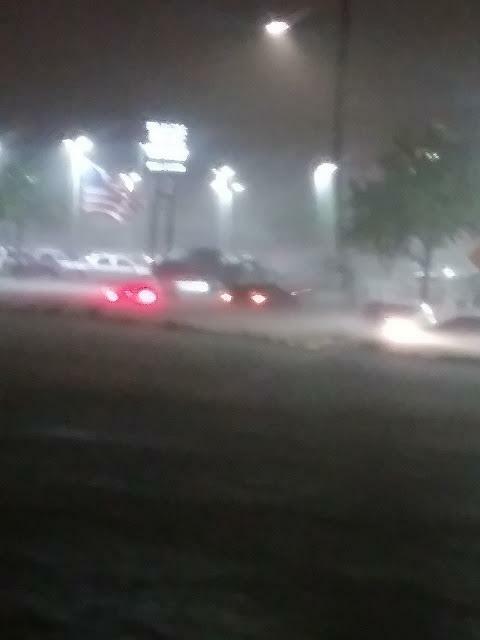 The first picture shows the worst of the rainfall, with water flooding car lots in their neighborhood. 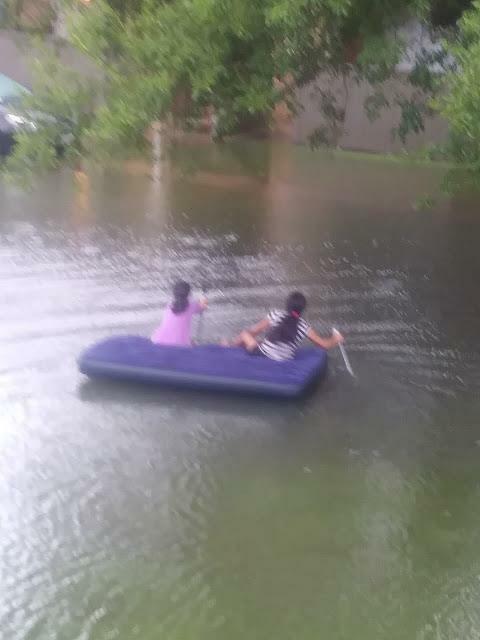 The second is a picture of their two girls, Vanessa and Liliana, riding on a raft in front of their apartment complex in Houston after the storms passed. We at the Family Care Network are able to support our HSP families above and beyond what our contracts allow as a result of our community’s generous donations. Please join this worthy cause, and support FCNI so that we can all be a bright light to families in need! If you would like to donate, please go to: FCNI.org.